Client Description: Iowa City Travel Agency. Project Objectives: Kiosk, Point of Sale, and Computer Support Services. Client Description: East side Iowa City Storage facility. Client Description: Best Burgers in Town! Project Objectives: Original Web Site Design, Search Engine Optimization, Site Administration, Hosting, and Content. Client Description: Native American cultural and archaeological museum. Project Objectives: Initial site design and structure that included ecommerce solutions. Client Description: Fantastic Used Book & Media Chain with 5 locations throughout Arizona. Organization: POLLWATCH: The National Organization of Citizen Exit Pollers. Project Objectives: Web Site Design and Infrastructure, Search Engine Optimization, Site Administration, Hosting, and Content. Results: Website was featured on national radio shows, blogs and political websites. In 2007 Acciona Energy built its Windpower Turbine manufacturing plant in West Branch, IA. Acciona is Spain’s largest Construction company and one of the largest corporations in Europe with operations all over the world. 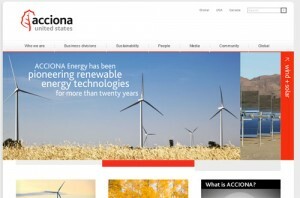 Acciona asked Guru To Go to assist in the design and management of its IT operations at the 25 Million dollar West Branch manufacturing plant and assist with developing the Wind-farm Scada operations at its post sales support center. Guru To Go worked directly with Acciona’s IT teams in Spain during the plant construction to design the greenest IT operations using state of the art Cisco Switches, Voip Systems, and Integrated Video Conferencing Systems. With over 100 computers, 350 network objects, multiple video conference rooms and an additional 50 mobile team members on wind-farm projects across the globe our support team assisted Acciona in developing the most efficient support system possible using simple common sense and straight forward assistance methods. We maximized remote support systems to increase green efficiency and extend our reach across thousands of miles. Apart from providing the day to day IT operations support for Acciona Windpower we also provided assistance with developing fiber optics solutions for Acciona’s turbine Nacelles and when asked how they could parse data from wind turbines all over the world and combine the data all in one place to report and gather tracking data Guru To Go provided a solution. Our software is still being used today by Acciona’s Scada monitoring teams to track problems with turbines and prevent future issues.